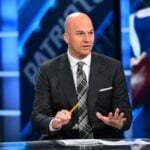 New Year’s Six is drawing close, and ESPN plans to deliver its most extensive presentation to date. ESPN has announced that this year’s New Year’s Six presentation will be its most extensive ever. The network is re-igniting it MegaCast production with an impressive 12 presentations so fans can fully experience Semifinal Saturday. New this year, ESPN2 has been added as a viewing option, along with multiple ESPN3 streams for select games. 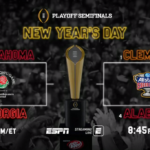 All the MegaCast and alternate viewing options for the New Year’s Six will be available on the ESPN App. Hometown radio calls of the game paired with the ESPN telecast. ESPN will station more than 50 cameras inside AT&T Stadium (Cotton Bowl) and Hard Rock Stadium (Orange Bowl). The RefCam will also make its CFP debut. This unique camera is affixed to the bill of two referees’ hats, providing a similar view as the refs’ line of sight. Line-to-Gain Pylon Cams: Wireless camera systems built into two movable pylons and repositioned throughout the game by the chain crew. 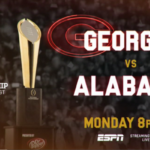 SEC Network will have a presentation for the Orange Bowl. 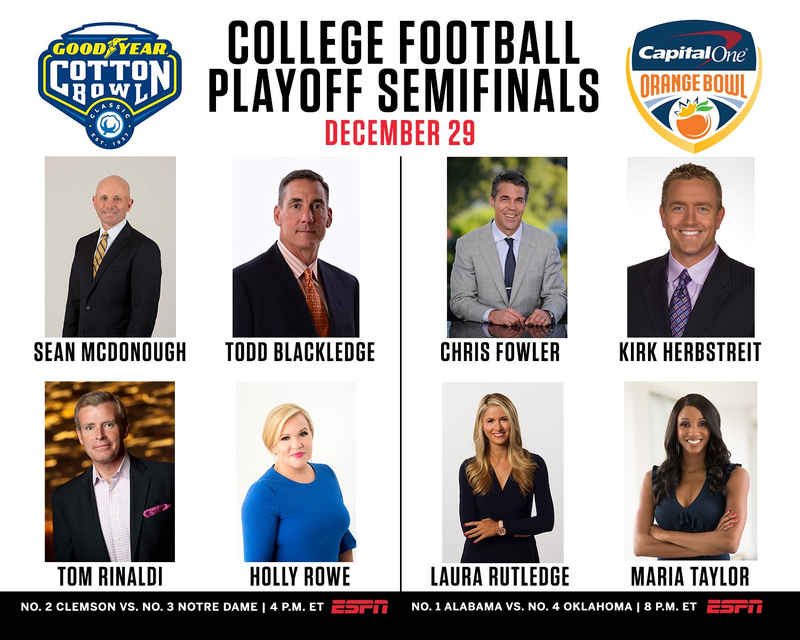 Chris Fowler and Kirk Herbstreit on Capital One Orange Bowl: Chris Fowler and Kirk Herbstreit will call the CFP Semifinal at the Orange Bowl, their fifth semifinal together and the only play-by-play commentator and analyst duo to call a CFP Semifinal in every year of the system. Laura Rutledge on Sooners: Laura Rutledge will be assigned to the Sooners. It’s her second consecutive year working a CFP Semifinal. 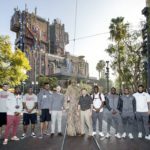 Sean McDonough and Todd Blackledge at Goodyear Cotton Bowl Classic: Sean McDonough makes his College Football Playoff television debut when the accomplished broadcaster calls the CFP Semifinal at the Cotton Bowl Classic, joining Todd Blackledge in the booth. Rowe Reports on Clemson: Veteran reporter Holly Rowe will be assigned to the Tigers and will report from Arlington. This is her fifth consecutive CFP Semifinal. Rinaldi on Notre Dame: Veteran reporter Tom Rinaldi will be assigned to Fighting Irish and will report from Arlington. This is his fifth consecutive CFP Semifinal.